Desmond T. Doss is dedicated to the academic and spiritual excellence of your child. We offer a high-quality, student-centered education at a price families can afford. 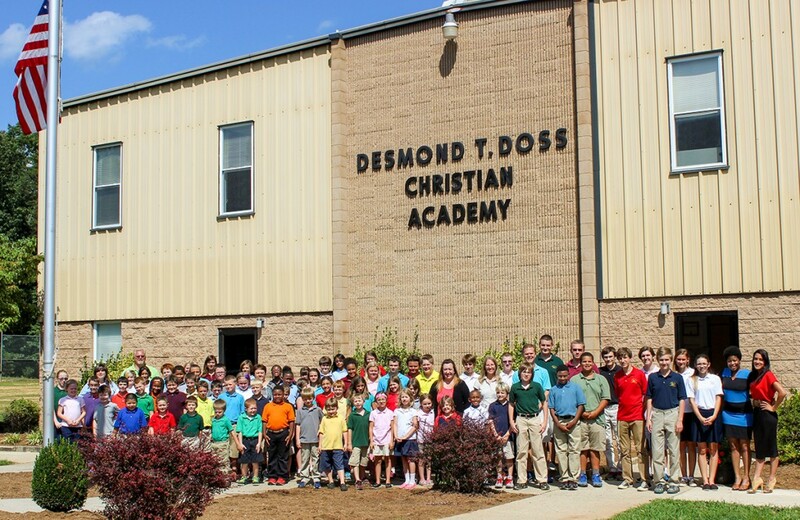 Why Choose Desmond T. Doss Christian Academy? We offer a qualified, motivated, and spiritual staff within a family-like atmosphere where your child will be loved, nurtured, appreciated, and given the kind of individual attention your child deserves. Because of our small class sizes, we can cater to both the gifts and struggles of each child, offering opportunities for children to work ahead where they are gifted and offering special help and even tutoring in areas they might be struggling. In addition, we provide regular opportunities and direction for each student’s spiritual and character development. We also offer a growing, vibrant sports program for your child, which currently features competitive cross-country and soccer teams, as well as a gymnastics program and recreational winter skiing. Add to this an on-site before and after school care program through the Bashful Giraffe Child Care Center, one of the premier childcare centers in Lynchburg, and Desmond T. Doss Christian Academy is hard to beat! And you receive all of this from one of the most affordable private schools in the Lynchburg and surrounding areas! Call us at (434) 237-1899 and schedule a time to come by and see us.